When President Theodore Roosevelt coined the term, he was thinking more about busting trusts than preventing cavities. But the phrase “bully pulpit” works in the context of dental care, too, at least when it comes to a state’s role in protecting the mouths of its citizens. A state dental director can evangelize — both inside and outside the bureaucracy — on the importance of oral health. And, it looks like Missouri might soon have its first periodontal proselytizer in about a decade. Word from the Missouri Coalition for Oral Health is that the state Department of Health & Senior Services could have a state dental director hired by the fall. Reconstituted about two years ago, the coalition has made the hiring of a dental director a top priority. Progress has come after the coalition … uh … put its money where its mouth is. The Missouri Foundation for Health and the REACH Healthcare Foundation, two of the coalition’s funders, each provided a chunk of the $333,000 the organization has pledged toward supporting the position during the first few years. The other contributor was Delta Dental of Missouri. With that seed funding, coalition officials are confident the state could sustain the work through federal grants from the Centers for Disease Control and Prevention and the Health Resources and Services Administration. Gary Harbison, executive director of the coalition, has estimated that Missouri could be eligible for nearly $700,000 a year in funding from those two agencies. 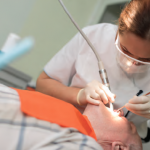 According to the Association of State & Territorial Dental Directors (ASTDD), 19 states have oral health programs with an annual budgets of at least $1 million. Policies that the coalition would like to see the state advance include expanding access children have to sealants, special coatings that can help prevent tooth decay. The coalition would also like more municipalities to add fluoride to the community water supply. According to the ASTDD, states bordering Missouri that have a dental director include: Iowa, Illinois, and Arkansas. Kansas has one as well, but Dr. Katherine Weno is vacating the post in a couple months to take an oral health leadership post with the CDC.